“We achieved to reduce the cost and time of installation significantly, but the installation in one day turned out to be a long-term goal. With the current technology, the goal of one day is too ambitious”, explains Prof. Martijn Wisse, from TU Delft /coordinator of Factory-in-a-day. 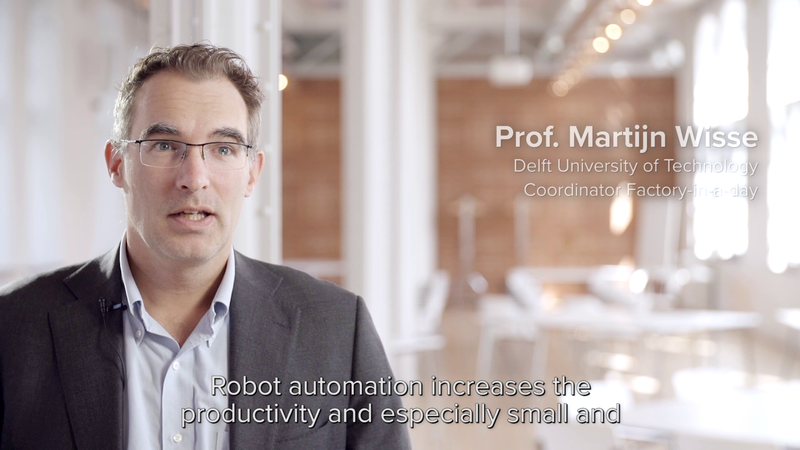 The project achieved some impressive results, which were also demonstrated at an event in the Delft Science Center by the end of September 2017. Among them is a demonstrator that combined the work of several partners, called Giftbot. The idea behind the demonstrator is a business of shipping small order gift boxes. In this demonstrator, a robot arm (UR5), covered with a robotic skin which was developed by partner Technical University of Munich, placed different items in boxes. The software integration and the flexible motion planning were done by TU Delft, and the gripper for grasping the different objects was designed by Materialise. The reviewers were happy with the results of Factory-in-a-day and they especially mentioned the great team effort and the huge improvements since the beginning of the project, in terms of pushing forward the technological developments. “One thing we achieved within Factory-in-a-day is that we combined different worlds. We managed to bridge people from different disciplines. For instance, in one of our demonstrators, which was focused very much on mechanical engineering, we integrated a ROS-based software element, something we did not imagine to happen in the beginning, since changing people’s mindsets is not an easy task“, explains Martijn Wisse. One other important result in terms providing long-term sustainability is the follow-up project of Factory-in-a-day called ROS-in (http://rosin-project.eu/). This project in the H2020 funding scheme is focusing on making ROS industrial the open-source industrial standard by providing funding for projects.